You might not always have fresh ginger on hand, whereas dried ginger is often a spice-rack staple. When you come across a recipe that calls for fresh or ground ginger, know that the two are not really interchangeable. There are other forms of ginger that are easy to keep on hand that you might have better luck swapping for fresh. If you are using ginger medicinally, you can substitute dried for fresh in some—but not all—cases. Fresh ginger does not taste much like ground ginger, advises the Dr. Gourmet website. Ground ginger is spicier, whereas fresh ginger has a mellow, full-bodied taste. Fresh ginger, however, has more pungency and adds more texture to dishes, notes Susheela Raghavan in "The Handbook of Spices, Seasonings and Flavorings." Also, flavor is released into a dish more slowly when you use fresh ginger. Ground ginger is more easily dispersed in a dish and can withstand higher cooking temperatures without compromising the flavor. The essential oils in fresh ginger disappear quickly at high temperatures, Raghavan notes. Ginger is available in many forms, including ground, fresh, crystallized and candied in syrup. While candied and crystallized ginger technically are condiments, they can work well in many recipes, according to Anne Gardiner and Sue Wilson, authors of the Exploratorium museum book, "The Inquisitive Cook." Each method of preserving ginger highlights a different flavor component, from pungency to spiciness. 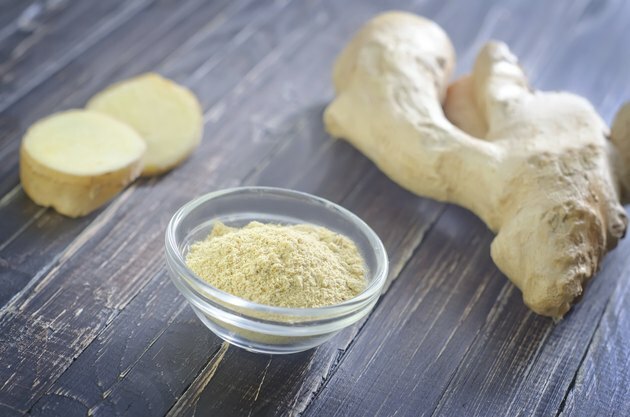 According to Dr. Gourmet, dried and ground ginger often are used to flavor baked goods like gingerbread in English cuisine, whereas fresh ginger is used by Asian and Indian cooks who use it for stir-fries and sauces. In a pinch, Dr. Gourmet recommends substituting 1/2 teaspoon of ground ginger for each 1 tablespoon fresh grated ginger. According to Dr. Gourmet, the best substitute for fresh ginger is ¼ cup crystallized ginger—with the sugar rinsed off—for every tablespoon of fresh ginger a recipe calls for. Even better, you can use minced ginger that is sold in jars in lieu of fresh ginger. Use the same amount that is called for in your recipe. People have used ginger as medicine since ancient times, according to University of Maryland Medical Center. Now it is recommended by health care professionals to treat and help prevent nausea and vomiting due to cancer chemotherapy, motion sickness or pregnancy and as a digestive aid for mild stomach upset. It also is commonly used for inflammatory conditions like arthritis. In medicinal use, 2 grams to 4 grams fresh root, or 0.25 grams to 1.0 gram ground, powdered root, can be used daily for indigestion, gas or nausea. Fresh ginger is best for colds, the flu, menstrual cramps, headaches and sore throats. Use 2 tablespoons shredded ginger steeped in hot water up to three times a day. Consult a doctor before administering ginger to children for medicinal purposes, advise UMMC experts. Ginger's side effects can include flatulence, bloating and heartburn. Ginger can worsen bleeding disorders and raise risk for bruising or bleeding. It also can worsen cases of low or high blood pressure, according to George T. Grossberg and Barry Fox in "The Essential Herb-Drug-Vitamin Interaction Guide." Fresh ginger has a stronger aroma than ground ginger. The "fresh" taste cooks seek in dishes initially comes from this aroma, Raghavan says. This aroma comes from the essential oils in ginger, its volatile component. These are lost when ginger is processed and stored.